ʿAbu al-Ḥasan Alāʾ al‐Dīn ʿAlī ibn Ibrāhīm al-Ansari known as Ibn al-Shatir or Ibn ash-Shatir (Arabic: ابن الشاطر‎; 1304–1375) was a Syrian Arab astronomer, mathematician and engineer. He worked as muwaqqit (موقت, religious timekeeper) in the Umayyad Mosque in Damascus and constructed a sundial for its minaret in 1371/72. Ibn al-Shatir most important astronomical treatise was kitab nihayat al-sul fi tashih al-usul ("The Final Quest Concerning the Rectification of Principles"). In it he drastically reformed the Ptolemaic models of the Sun, Moon and planets. His model incorporated the Urdi lemma, and eliminated the need for an equant by introducing an extra epicycle (the Tusi-couple), departing from the Ptolemaic system in a way that was mathematically identical to what Nicolaus Copernicus did in the 16th century. Unlike previous astronomers before him, Ibn al-Shatir was not concerned with adhering to the theoretical principles of natural philosophy or Aristotelian cosmology, but rather to produce a model that was more consistent with empirical observations. For example, it was Ibn al-Shatir's concern for observational accuracy which led him to eliminate the epicycle in the Ptolemaic solar model and all the eccentrics, epicycles and equant in the Ptolemaic lunar model. His model was thus in better agreement with empirical observations than any previous model, and was also the first that permitted empirical testing. His work thus marked a turning point in astronomy, which may be considered a "Scientific Revolution before the Renaissance". Drawing on the observation that the distance to the Moon did not change as drastically as required by Ptolemy's lunar model, Ibn al-Shatir produced a new lunar model that replaced Ptolemy's crank mechanism with a double epicycle model that reduced the computed range of distances of the Moon from the Earth. This was the first accurate lunar model which matched physical observations. 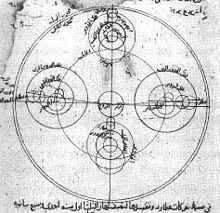 Although Ibn al-Shatir's system was firmly geocentric (he had eliminated the Ptolemaic eccentrics), the mathematical details of his system were identical to those in Copernicus's De revolutionibus. Furthermore, the exact replacement of the equant by two epicycles used by Copernicus in the Commentariolus paralleled the work of Ibn al-Shatir one century earlier. Ibn al-Shatir's lunar and Mercury models are also identical to those of Copernicus. This has led some scholars to argue that Copernicus must have had access to some yet to be identified work on the ideas of ibn al-Shatir. It is unknown whether Copernicus read ibn al-Shatir and the argument is still debated. The idea of using hours of equal time length throughout the year was the innovation of Ibn al-Shatir in 1371, based on earlier developments in trigonometry by al-Battānī. Ibn al-Shatir was aware that "using a gnomon that is parallel to the Earth's axis will produce sundials whose hour lines indicate equal hours on any day of the year." His sundial is the oldest polar-axis sundial still in existence. The concept later appeared in Western sundials from at least 1446. Ibn al-Shatir also invented a timekeeping device called "ṣandūq al‐yawāqīt" (jewel box), which incorporates both a universal sundial and a magnetic compass. He invented it for the purpose of finding the times of prayers. Other notable instruments invented by him include a reversed astrolabe and an astrolabic clock. ^ Roberts, Victor (1966). "The Planetary Theory of Ibn al-Shatir: Latitudes of the Planets". Isis. 57 (2): 208–219. doi:10.1086/350114. JSTOR 227960. ^ Y. M. Faruqi (2006). "Contributions of Islamic scholars to the scientific enterprise", International Education Journal 7 (4): 395-396. ^ Neugebauer (1975), volume 3 at pages 1108-1109. ^ Swerdlow, Noel M. (1973-12-31). "The Derivation and First Draft of Copernicus's Planetary Theory: A Translation of the Commentariolus with Commentary". Proceedings of the American Philosophical Society. 117 (6): 424. ISSN 0003-049X. JSTOR 986461. ^ Linton (2004, pp.124,137–38), Saliba (2009, pp.160–65). ^ "History of the sundial". National Maritime Museum. Archived from the original on 2007-10-10. Retrieved 2008-07-02. ^ King, David A. (1983). "The Astronomy of the Mamluks". Isis. 74 (4): 531–555 [545–546]. doi:10.1086/353360. Kennedy, Edward S. "Late Medieval Planetary Theory." Isis 57 (1966):365-378. Kennedy, Edward S. and Ghanem, Imad. The Life and Work of Ibn al-Shatir, an Arab Astronomer of the Fourteenth Century. Aleppo: History of Arabic Science Institute, University of Aleppo, 1976. Roberts, Victor. "The Solar and Lunar Theory of Ibn ash-Shatir: A Pre-Copernican Copernican Model". Isis, 48(1957):428-432. Roberts, Victor and Edward S. Kennedy. "The Planetary Theory of Ibn al-Shatir". Isis, 50(1959):227-235. Saliba, George. "Theory and Observation in Islamic Astronomy: The Work of Ibn al-Shatir of Damascus". Journal for the History of Astronomy, 18(1987):35-43.